Merry Christmas from the Arnhem Land Barra Lodge... the Big Wet is Coming. Get in quick as bookings are limited to the last week of February, and months of March and April 2017. Re-opens for fishing tours during April 2017. Be one of the first to experience this very exclusive location now that it has reopened for fishing. Well it was quite apt to end our season on a high note, with regular visitor Steve Shervill landing a feisty 106cm barra on the very last day of fishing. Some of Steve’s group chose to get the full picture of angling opportunities that Barra Lodge offers, heading out to do battle with the myriad of blue water species that are available to us year round. Golden snapper, coral trout and bluebone were captured on soft plastics jigged on the bottom, whilst Spanish mackerel, longtail tuna, queenies and trevally all kept the anglers busy on poppers, metals, plastics and trolled hard bodies. Steve’s 106cm wasn’t the only chunky barra around, with a couple of 97cm models and a few more in the 90s released to fight another day, as well as some ripper black jewfish on the rock-bars. So now we get set for 2017 Runoff season, with more exciting upgrades which are sure to make our guests very happy, both on and off the water. Outback Spirit has taken the Barra Lodge to the next level in 2016 and all the staff are committed to providing the trip of a lifetime for all our guests in 2017. A report in the NT News Friday 9th December by the BOM indicated that the NT should experience three times the monsoonal activity this wet season compared to our last wet season, which was quite poor. The great news is that that our first monsoon will arrive pre-Christmas. Active monsoons mean serious rainfall and it’s a simple fact that, when you have a wet season with an early monsoon combined with several further monsoonal surges over northern Australia, the big Top End river floodplain catchments overflow and the inland aquatic food chain goes into overdrive. Bear in mind that we have just experienced one of our wettest Build-up season in a long, long time. Starting right from early September and still continuing, regular afternoon storms have sent good rains across the Top End. It means that all the floodplains are saturated and the first monsoonal deluge will stay above the ground and cause widespread flooding. From the smallest microscopic organisms to the largest predators, the Top End’s swollen floodplains then become transformed into a smorgasbord of aquatic life of unprecedented magnitude. 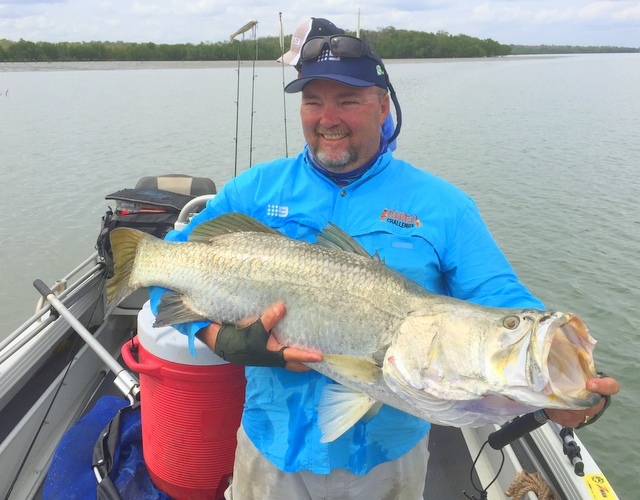 Once the flood waters start to recede, and the Runoff begins in earnest, all that nutritious barra fare will be pouring out through flowing feeder creeks into the main river channels. Barra will be lined up, lurking, ready to pounce on anything that presents as an easy meal. Hotspots such as creek mouths with their contrasting colour changes, quiet back eddies adjacent to fast-flowing water, submerged rock bars, sunken timber snags will have their attendant barra sentries ever ready to snap up disoriented baitfish, cherabin (freshwater shrimp), tadpoles and other organisms that are flushed out with the flow of water receding off the floodplains. 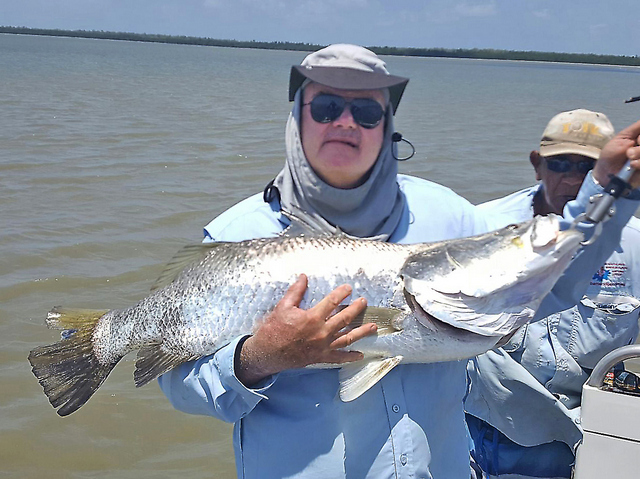 Anglers who can tap into barra that are feeding in these conditions can experience wonderful, exciting fishing that can equate to a fish a cast and numbers that resemble triple-figure cricket scores. Significant rainfall outcomes from a good “Wet Season” in the river catchment basins will ensure that all our rivers will experience good flows of freshwater which will continue throughout the year. This will encourage the barra to remain within saltwater estuaries and migrate through the river watercourses enticed by the scent of fresh sweet waters upstream and bountiful food sources for the entire year right through into the “Build Up” in October and November. Some more great news for the 2017 season is that all our OceanMaster boats will have been fitted with brand new Suzuki four-stroke outboards. Already our two largest boats – the OceanMaster 741s – have 250hp Suzuki engines. During the off-season before the Runoff, the remaining OceanMasters will be fitted 150-200hp Suzukis. 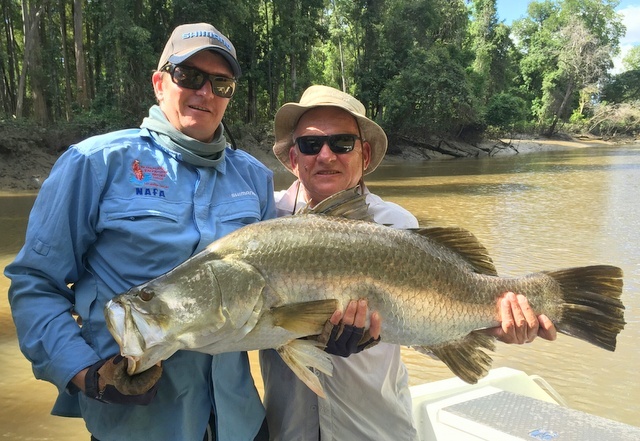 Doug Blockey’s 95cm barra in November went close but didn’t quite make the metre mark. It was a great catch just the same. A 106cm barra for Steve Shervill was the final metrey for 2016. Steve landed his big bucket-mouth with the assistance of Lodge guide Lance Butler on the final day of the 2016 fishing season. Triple barra hook-up, a common occurrence at the Barra Lodge during the Build-up when barra are feeding aggressively. 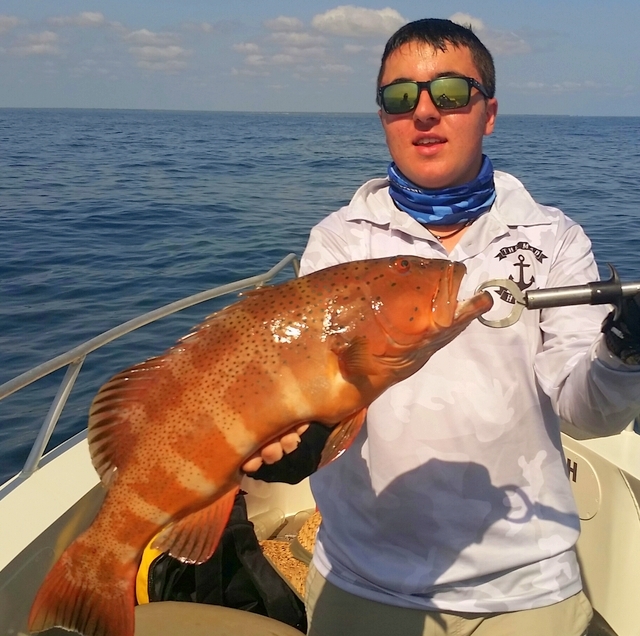 Tommy Altomonte with a superb coral trout jigged up off an inshore bommie. You never know what will jump on the end of your line when fishing the pristine inshore waters of Arnhem Land. 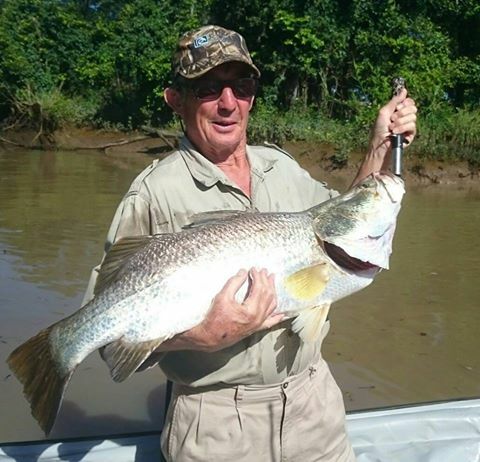 Alexis Taylor visited the Barra Lodge in November and had a fantastic time. She was very pleased with this beaut 85cm saltwater barra which was just one of many she landed. 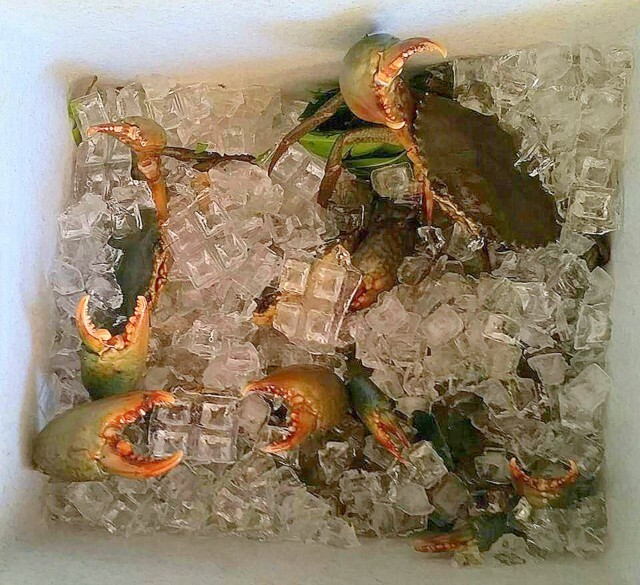 Muddies on Ice – chilling out, destined for the Lodge dinner table. "I cannot think of any thing that could have been improved. Will make recommendations to all I know who love to fish. Absolutely the best trip I have ever been on. All the staff where excellent and in particular the fishing guides went the extra distance to ensure we were spoilt with fish." "Tides weren't great and fishing was a little hard going, but the guides made the most of what was available so very happy. Good mix of off-shore and barra fishing." "Thank you to all the fabulous team who made our fishing adventure a fantastic and memorable one. A special thanks to Andy our guide for getting us onto the fish and being great company on board the boat. It was great learning a few tips from you." "The change in the lodge had to be seen to be believed. It was noticeable not only in the improvements in the accommodation, food and boats but also in how much happier the guides seem to be. We had a full house but it was run like a well oiled machine. Hats off to Shaun and Andy - they made the trip." "The entire staff went out of their way to make our trip a success. It was the best fishing trip we have ever had. Lance and Ben taught us so many things and showed us how to really catch fish. The accommodation was impressive. The food was fantastic. The girls were so helpful and nice. Shaun was hovering over everything to make sure it was done well." "Great service, friendly staff, good food, clean and well-maintained air-conditioned tents, knowledgeable guides, learnt new tactics. We enjoyed our day out with Lance Butler." "An outstanding fishing experience. I took my father to the Lodge for his 80th birthday. The staff couldn't do enough to make him feel special and worked incredibly hard to get us onto the fish. He will remember this trip for the rest of his life." 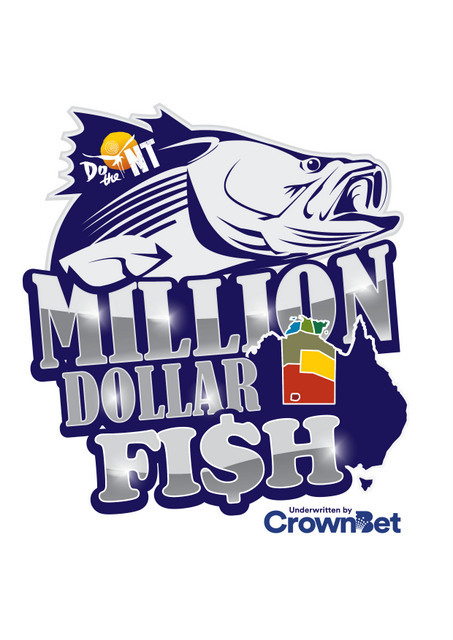 The Million Dollar Fish competition continues until the end of February and our Runoff season commences 21 February. There are still some great spots available during the last week of February. 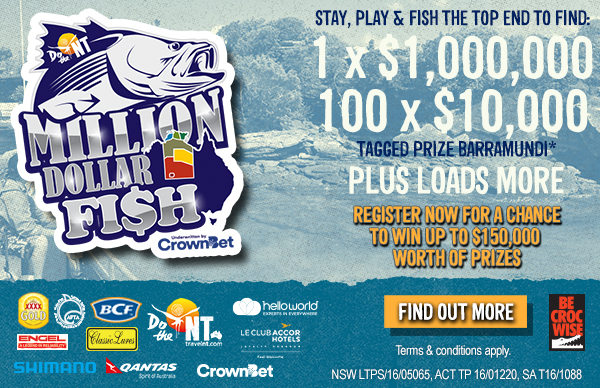 CATCH A $10,000 TAGGED BARRA AT THE BARRA LODGE AND WE’LL MATCH IT WITH ANOTHER $10,000 TOWARDS YOUR NEXT LODGE TRIP. Seven Spirit Bay Wilderness Lodge will reopen for fishing tours in 2017. The Lodge is situated on the western side of Port Essington on the Cobourg Peninsula and operated by Outback Spirit Tours. 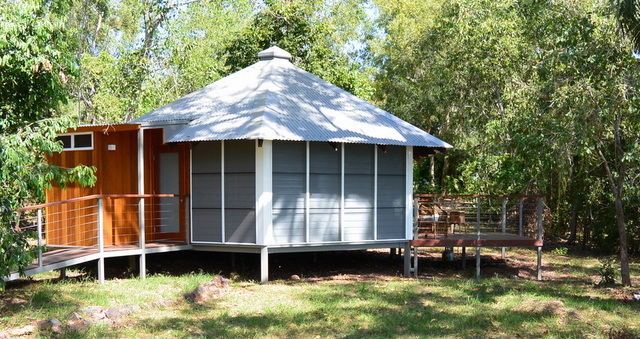 It represents a sister destination to the Arnhem Land Barramundi Lodge at Maningrida. Initially fishing tours will be available in April and October 2017 but, subject to demand, tours may be extended into March as well. 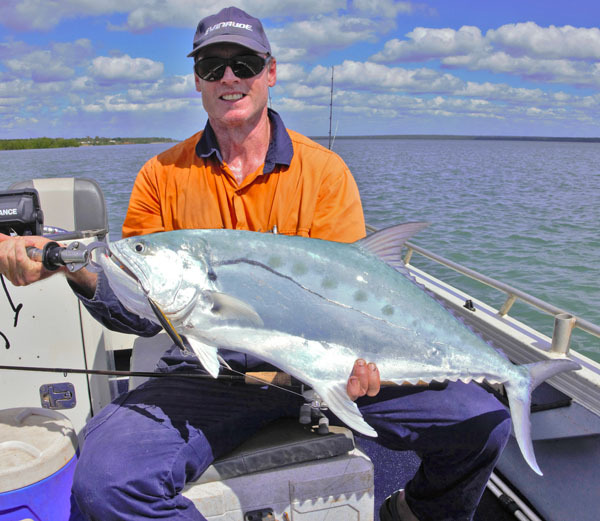 With the pristine waters of Port Essington on the Lodge’s doorstep and the fish-rich Arafura Sea just to the north, opportunities for keen anglers to explore and fish this scarcely-visited, remote region abound. 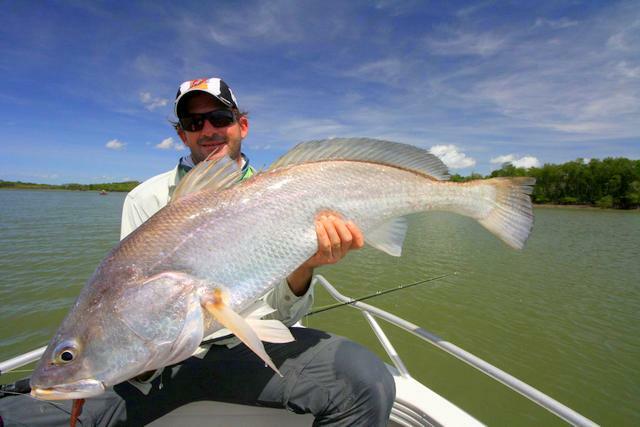 Combining fantastic fishing opportunities with a luxurious resort-style Lodge situated in one the most remote areas of the Northern Territory is a recipe for an unforgettable wilderness adventure. The magnificent Seven Spirit Bay Wilderness Lodge. 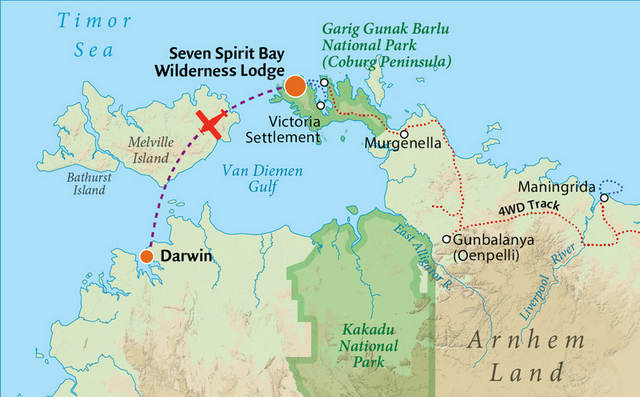 Seven Spirit Bay Wilderness Lodge is a short 45 minute scenic flight from Darwin. Seven Spirit Bay sportfishing boats cater for the diverse array of amazing fishing opportunities on the remote Cobourg Peninsula. 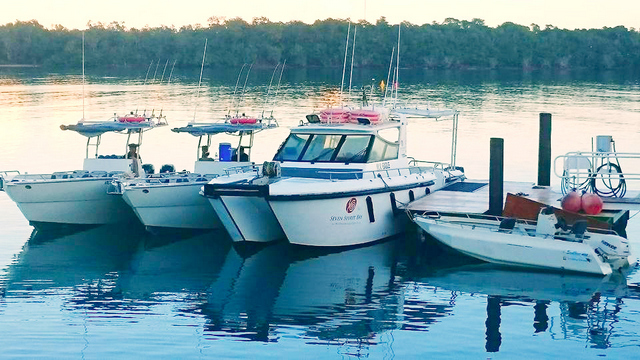 All fishing is from the Lodge’s custom twin-hull cat-style MV Eagle, a purpose-built, stable 11 metre craft, and 7.6 metre Eliminator sportfishers, MV Victoria and MV Coburg, all of which are powered by late model Suzuki outboards and skippered by your own personal fishing guide. Lodge guests have access to the pristine waters of Port Essington and beyond. The coastline features huge expanses of coastal beaches, rocky headlands, inshore and offshore reefs plus a number of tidal estuarine creeks – all of which are a fishing paradise. 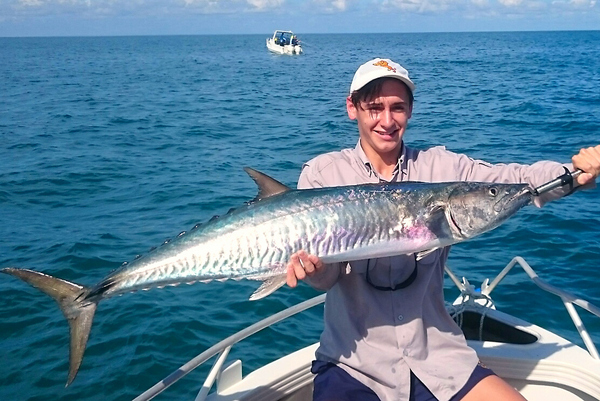 There are plenty of opportunities for fantastic bluewater fishing for a variety of desirable pelagic species such Spanish mackerel, broad-bar mackerel, giant trevally (GTs), queenfish, longtail tuna, giant herring and golden trevally. If jigging over the inshore reefs is more your style, golden snapper, coral trout, bluebone, estuary cod and many other reef species are a welcome addition to the Lodge menu. 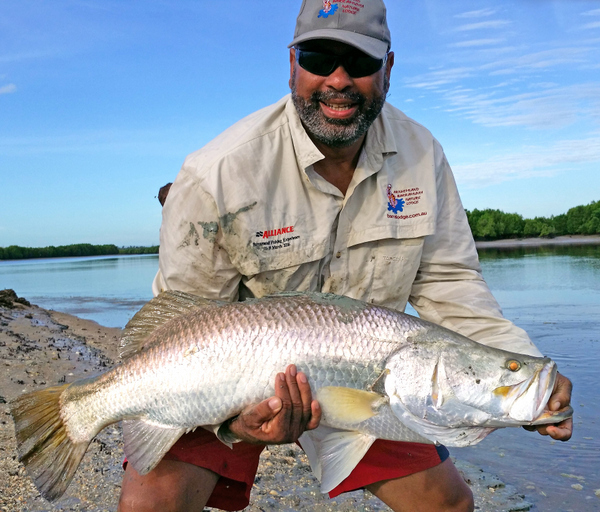 Meanwhile barramundi, threadfin salmon and mangrove jack inhabit the coastal creeks and can often be sight-fished in these sandy, clear, pristine waterways. As with the Barra Lodge, at Seven Spirit Bay there will be ample opportunities to enjoy the fine table fish that you catch, skilfully prepared by the Lodge’s resident chef. Seven Spirit Bay Wilderness Lodge as viewed from the private jetty. 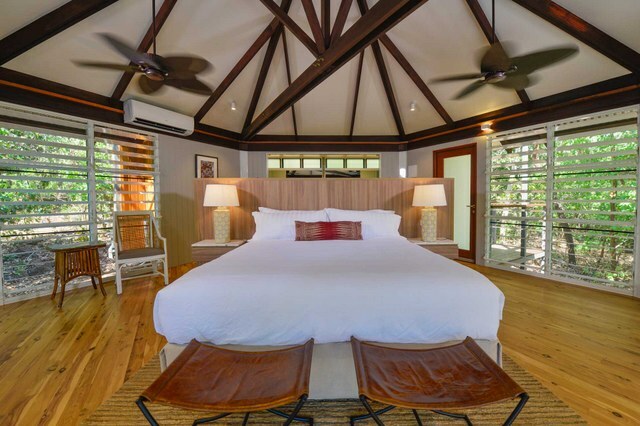 Seven Spirit Bay is a luxury wilderness lodge located on the western side of Port Essington on the Cobourg Peninsula along the Northern Territory’s northern coastline some 200km northeast of Darwin. 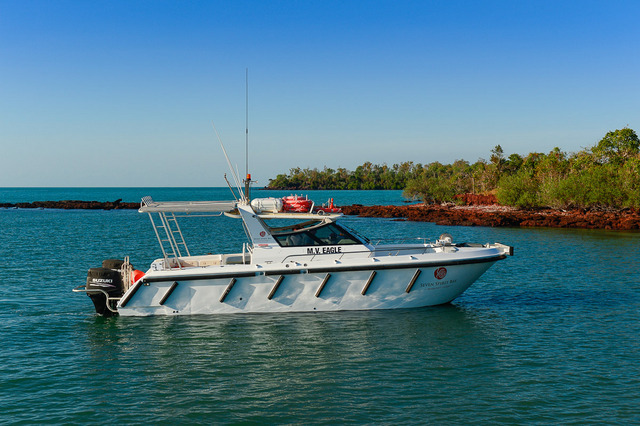 It is only accessible by boat from Black Point on the eastern shore of Port Essington, or by a 45 minute scenic flight from Darwin, across Van Diemen Gulf to the Lodge’s private airstrip at Vashon Head. 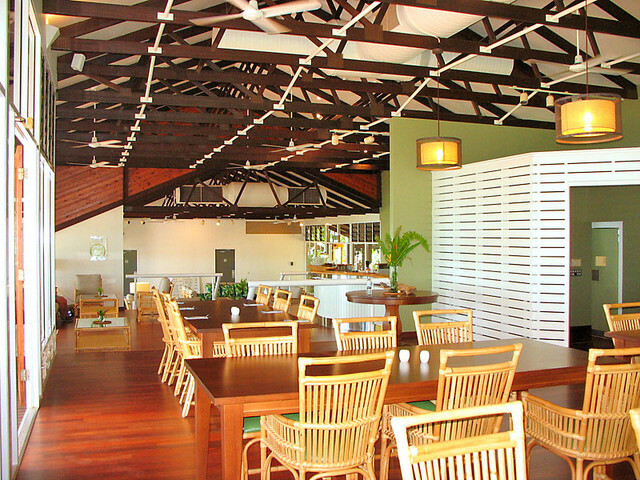 The Lodge is an easy 20km drive through tropical savannah bushland from the airstrip. 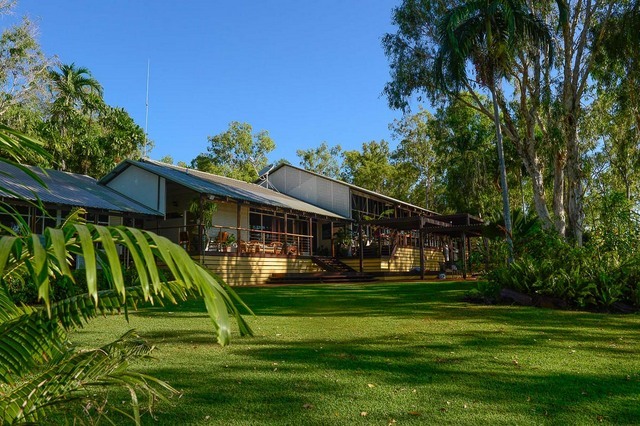 Seven Spirit Bay is an iconic Northern Territory wilderness lodge and one of the very first luxury lodges in the Northern Territory’s outback, having been originally built in 1990. 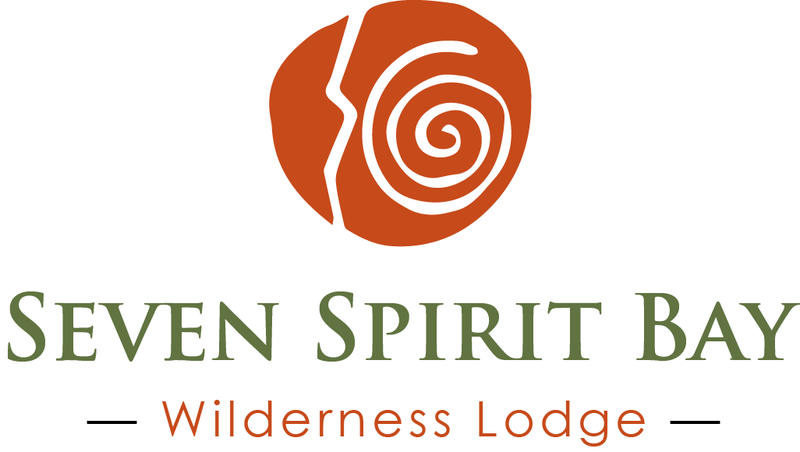 Acquired by Outback Spirit Tours in 2015, Seven Spirit Bay Wilderness Lodge received a new lease of life thanks to a $3.5 million redevelopment that was completed in April 2016. The main Lodge has amazing waterfront views and a superb tropical palm-fringed swimming pool that overlooks the idyllic waters of Coral Bay. 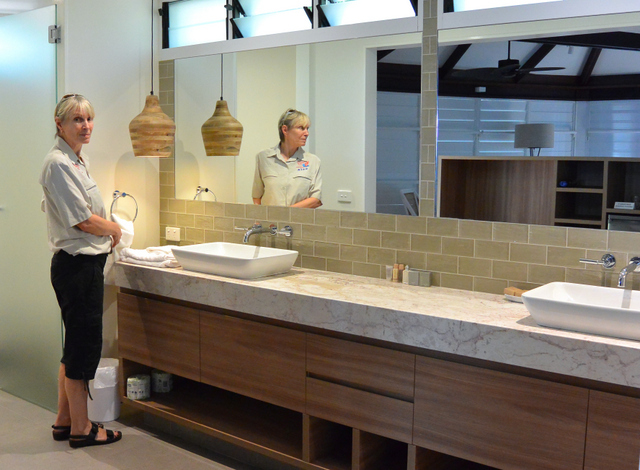 Ultra-luxurious “habitat” accommodation is twin share and features architecturally designed ensuite bathrooms, beautiful furniture and a front balcony which is a great place to soak up the secluded ambience of this remote location. Seven Spirit Bay Wilderness Lodge is part of Outback Spirit’s chain of luxurious bush Lodges that are dotted across Arnhem Land which also includes the famous Arnhem Land Barra Lodge at Maningrida and a another new camp established near Ramingining, the Murwangi Safari Camp. Each of these remote locations is visited during their 12 day Arnhem Land wilderness adventure bus tours culminating with the final stopover at the jewel in the crown, Seven Spirit Bay. The Lodge has a small fleet of purpose-built, magnificently-appointed sportfishing boats. Inside the main Lodge features a comfortable lounge, bar and well-appointed dining room. 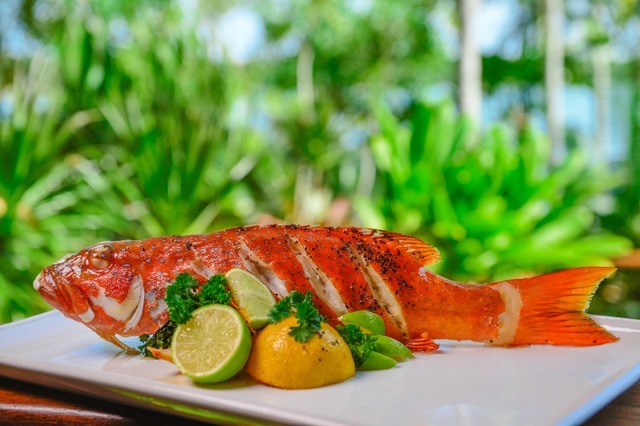 Locally-caught fresh seafood is a Lodge speciality. Above: Deluxe ensuite air-conditioned “habitat” accommodation. 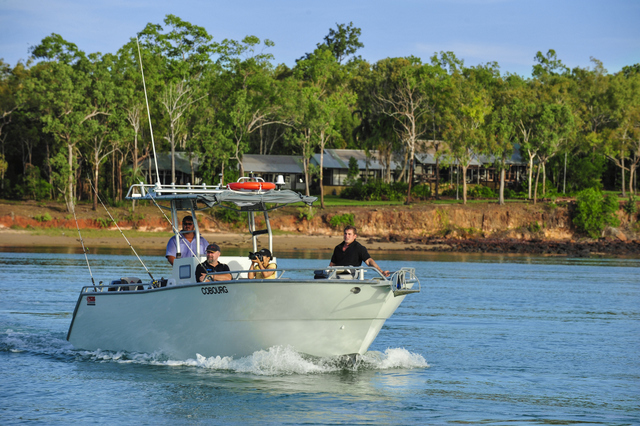 MV Eagle is an 11 metre twin-hull cat-style that provides a superbly-comfortable fishing platform, front and rear. Other activities at Seven Spirit Bay include a visit to the historical ruins of the Victoria Settlement (a British outpost established in 1838 and abandoned in 1849), four wheel drive wildlife safari tours, and guided nature and bird-watching walks. We are able to tailor packages to suit each individual client’s requirements, including: accommodation, fishing preferences and chartered flights. 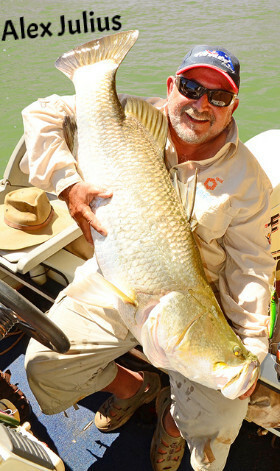 Don Russell’s 108 cm Barra was his second metre-plus barra landed on consecutive days fishing at the Lodge at the beginning of March. 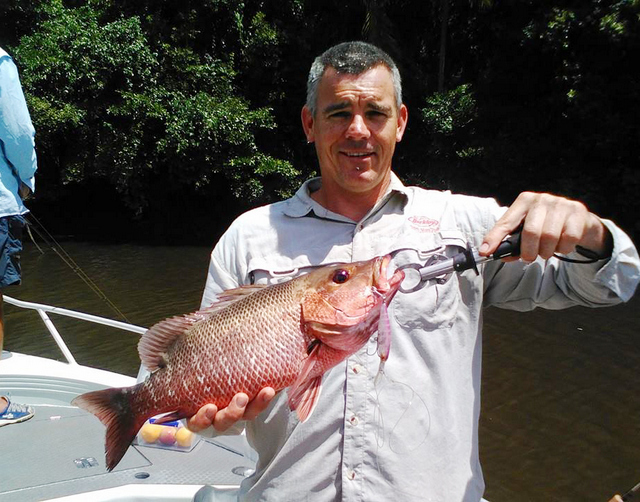 Joe Ray almost made the metre-plus board in March with this beautifully-conditioned 99cm salty barra. Huge schools of Spanish mackerel and associated calm seas are often prevalent during the Runoff. Razor-sharp fangs and blistering speed are the trademarks of this blue water predator. 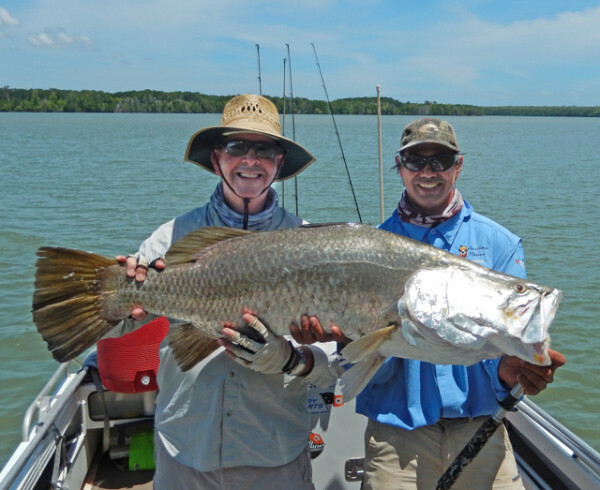 Guide Peter Twine (left) assists Maurice Tulich for a quick pic of Maurice’s 116cm barra before release. 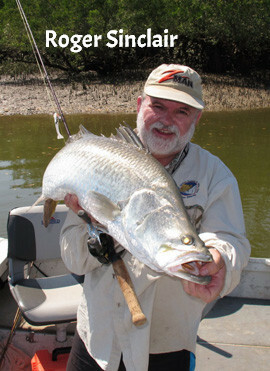 The Runoff is a great time to target metre-plus barra. 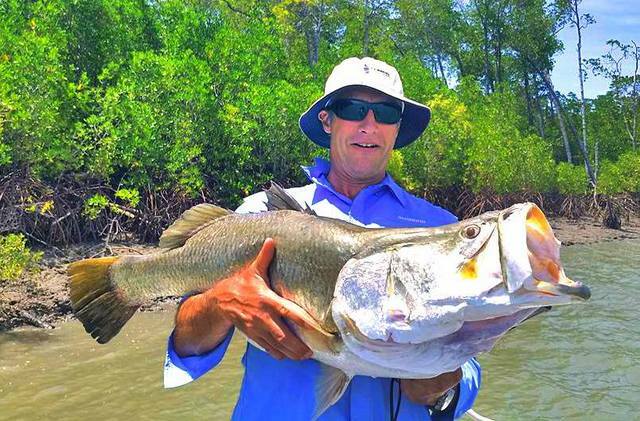 David Mathersul landed his PB 94cm barra in April after a mighty tussle in tight water. Stud mangrove jack hit lures with hammer-like strikes and are regularly caught during both the Runoff and Build-up. Black jew holding on shallow rock-bars will readily eat hard and soft body lures when rolled across the bottom while targeting barra. Hook one of these steam trains and find out what a smoking drag is all about. 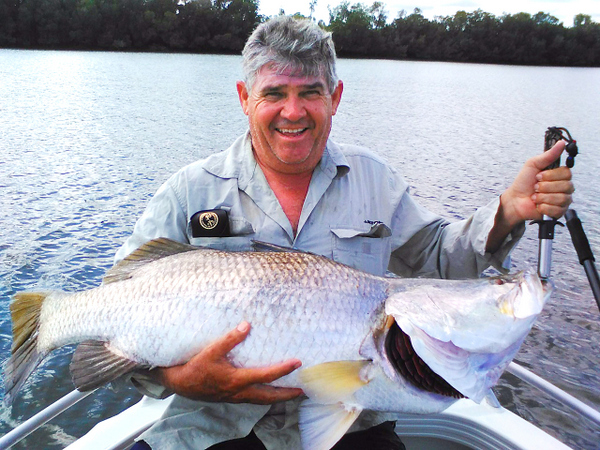 Andy Currie’s 106cm barra was one of two metreys he landed on consecutive days in October. This one was landed on a Classic F18 with guide Andy Taylor. Big queenies are a handful at the best of times and on barra gear they can test the angler and tackle to the limit. 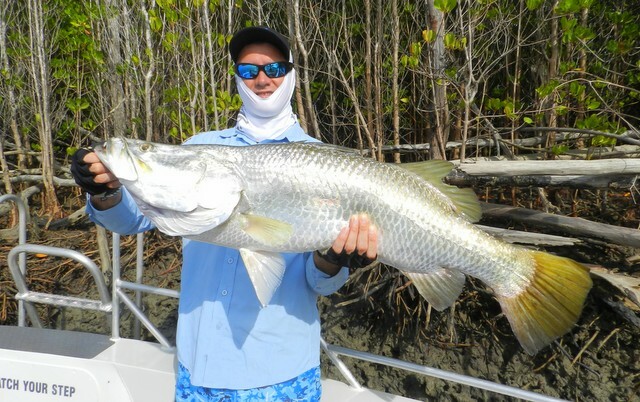 Michael Day was expertly guided by Lance Butler to land two metre-plus barra during his stay in October. This one went 109cm. Alex and Roger have both guided many times at the Barra Lodge, and both have the names of happy clients up on the Barra Lodge Metre Board. 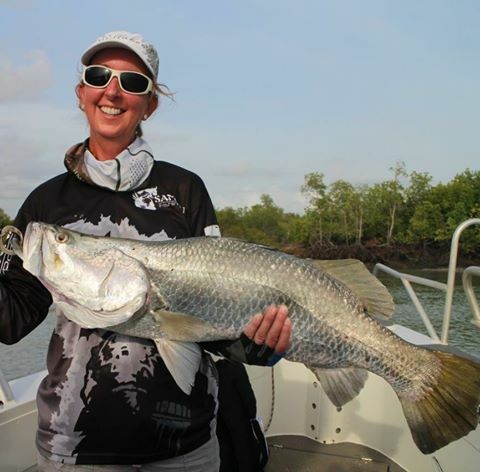 Additionally, both these expert anglers are multiple-tournament winners and are highly regarded amongst their peers in the Top End. They are also well-acquainted with the fabulous sportfishing at Seven Spirit Bay Wilderness Lodge. In fact, at one time Alex operated his own safari camp in Garig Gunak Barlu National Park Arnhem Land not far from where Seven Spirit is now. 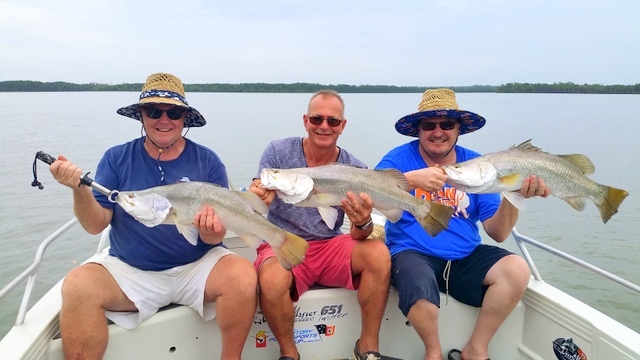 Alex and Roger will be able to impart their extensive knowledge about the incredible fishing on offer both in the Maningrida region where the Barra Lodge is located and on the Cobourg Peninsula where Seven Spirit Bay is located.